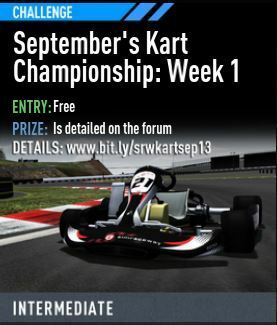 Join us for the free to enter, SRW World Karting Championship events. 4 Challenge events will be spread across the month of September. The events will be broken down into 1 per week. Each week, the challenge event will allow players to compete in and you can score points in the championship by participating in each event. The NASCAR style points system is perfectly suited for the event, but I did not feel that the number of participation was strong enough to warrant scoring so far down the field. On the flip side, I did not feel the traditional world karting points system was far enough down the field (only the top 15 score points). After much thought and discussion with SRW_Cossacco, we have agreed on a new points system that follows the Motorsports South America Karting points system. This rewards participants down to 32nd position so it is a good fit for this event at this time. NASCAR points system may return one day if more people join in. In August, we had 3 challenge events per week which was possibly putting some people off or splitting their attention too much between the events. I have now opted for a more focussed 1 challenge per week arrangement but doubled the race distance so we shall really see some more enhanced consistency elements now. You asked for it and we are delivering it! On Saturday the 14th and Saturday the 28th of September, SRW_Cossacco will be hosting an all new bonus round which features 5 live race Heats and 1 final live race event. Players enter the heat events and the top 3 finishers of each heat will qualify for the final live race. All players in the final live race will scoop some bonus championship points! (15 drivers in total). At the end of September, we will add up the 3 best results out of the 4 weeks for each driver and add up the points, along with the bonus points from the heat events. The driver with the highest number of points wins the title of SRW World Karting Champion. I hope you enjoy these changes and look forward to crunching the numbers each week for you guys. Edited by RickSpeed, 09 September 2013 - 06:54 AM. DUE TO PROBLEMS SIMRACEWAY ENCOUNTERED THIS WEEK, THESE RESULTS HAVE NOW BEEN DISQUALIFIED TO KEEP THINGS FAIR. Points Awards: Top 3 from each heat advance to Main race. Points Awards: Top 3 advance to Main race. Edited by RickSpeed, 28 September 2013 - 11:28 PM. well....it´s september 2nd, nothing in events section.. Sorry for the delay in the start. Coss will be posting the event up today. Wow super excited about the new format, hope it attracts a lot of interest and builds a platform for other championships in different cars. Thx for setting this up Rick & Coss. Still i think the kart in SRW isnt the best, the steering requires almost no corrections. A real life rotax max is always loose from the rear because otherwise it bogs the narrow powerband. Not even the biggest beginners set their kart up to understeer because the peformance loss is obvious. The kart should be very easy to get sideways but not easy to lose it. Also the steering should be much more firmer, not so soft around the middle. Like the megane or F3. Also remember, that from 7500 to 12500rpm, a rotax has power oversteer. Watch this video for example: minimal steering angle with constant correction in the OPPOSITE direction, but mostly just to 0 degrees. See how the kart is guided in the turn, and from apex on the wheel is almost centre while the kart is still turning with sliding. That is the ´´zero steering´´ we all know from loading screens., current srw kart you have to just take off the steering angle for a second but not put it in negative. That is how all racing karts are driven in the limit. Only thing i can be really happy with in the game are the brakes. Without ABS they lock very realistically and kill the revs. I hope all the events will be without ABS because it feels very real like that. elite, im sure you can agree with these points? Also i noticed one bug: all the events are with 1 liter fuel tank but fuel usage turned ON. How should that work? I think in hotlaps all the wear should be turned off. See how the kart is guided in the turn, and from apex on the wheel is almost centre while the kart is still turning with sliding. That is the ´´zero steering´´ we all know from loading screens. Good luck guys. The first challenge will be online asap and will be extended accordingly. Sorry for the delay guys. Week 1 event will begin in about 30 minutes from the moment of posting this. We missed the starting date of 1st September, so it will be extended by 2 days and end on 8th instead 6th. Live race would definitely be a great addition to the Race-Offs, but not as long as there's no driver in the kart. Good luck guys - enjoy! I agree Lounger, the kart does have quite a lot of understeer and is too stable on the power however I feel the current physics are a vast improvement compared to the old one. A Rotax will try to step out in faster corners above 7500rpm on a Senior Rotax Max but not sure on a junior version as this is. The senior one has a power valve as you probably know which provides extra horsepower above 7500rpm. The brakes are much improved also because I used to be able to lap sonoma without using brakes but now you have to brake every corner which is correct but thats probably to do with the understeer on this version. Glad your competing in this and I hope a lot more will also. Haha, i'm not unbeatable mate, there are quite a few who could beat me but I will put up a fight again this time. Atm i really wouldnt be able to tell im driving a kart if it wasnt for the looks. As i have said, a Mazda Furai or Ariel Atom handles much more like a kart than the kart. I tried doing laps around troyton and i found it very underwhelming. Only challenge is to kind of get the turnin accurate and maybe get one wheel on the curb to get the car to turn in. But ingeneral i had front tyre temps 30 higher than rears and i simply quit midway. This system of championship is 100% awesome but i cant love this kart. I dont think there has to be a major redesign, just make the rear ten times stiffer or do whatever it takes setup wise to kill the understeer, that will do for now but yes some time in the future you guys really should reconfigure the engine power map to be much less linear. In all honesty as a simulator I feel the Simraceway kart teaches me bad habits that I do not want to take to the track with my real kart. You brake way longer then what you would in an actual kart. Due to the understeer you have to turn in a lot sooner then you really want in a Tag kart. You cannot carry near as much corner speed as a real kart. There is no way you have enough grip to get the inside rear to lift for turning like you setup a real kart to do. In Simraceway the grip levels and how the kart handles I feel there would never be the need for a ribvest since the kart never generates the grip or changes direction fast enough to even stress the drivers ribs. The closest the simraceway kart comes to driving like a real kart is like you are on a very green track surface with absolutely no rubber down. It is fun to drive but nothing like an actual kart. You are right there CROSS, I hadn't looked at the stats of the SRW Kart before although the actual visual of the engine is a junior without a power valve and you don't get the same sensation when the power valve would kick in. I think most of us agree the kart doesn't feel exactly like real life and that would be due to the inside rear not lifting like you mentioned but I can't see an update on this in the near future as they have recently updated it and the kart doesn't appeal to most as it's seen as entry level and most want to drive the fast cars. I see it as fun and not as a training tool. If I wanted a training tool I would use KRP as it's closest IMO. Kartsim was also looking promising but that seems to have died. I use SRW SRO's as my training tool for focus, concentration & consistency over race distances.